WELDING LATHE EQUIPMENT DEMONSTRATIONS: A potential customer can visit PWS and acquire hands-on use of the available equipment in our weld lab. At that time we can discuss applications, tooling and weld parts for evaluation. Usually there is not a charge for a customer to visit. With equipment demonstration the customer can find out the pros and cons of his particular welding application. FREE OR LOW COST WELD DEVELOPMENT: Weld development is usually a free service as long as the application can easily be set up with our existing equipment, fixture and tooling. For more elaborate weld tests that would take more than a day or would require special tooling we would quote a minimum fee to run a process welding program. The program would include setting up equipment, building tooling and weld reports. WELD TRAINING: We can train your welding staff with use of the welding processes, equipment care, preventive maintenance, safety procedures, electrical trouble shooting and weld development. EQUIPMENT AVAILABLE IN OUR WELD LAB: 160 watt Nd: YAG laser. Mobile unit with X/Y/Z and R axis of travel with THK precision slides, teach function CNC control for straight line and circular welds. PWL 12-16 Welding Lathe, RWP-100 Rotary Positioner and TS-100 Torch Stand. The lathe and positioner are controlled with the SCS-102 Solid State Speed Control. 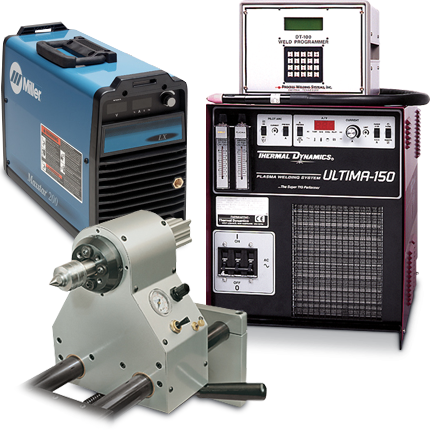 Both pieces of equipment can be interfaced and used the DT-100 Weld Controller which can be used to program and control rotation speed of the lathe and positioner. Tube and wire welding system for semi-automated welding of small medical wires and tubes. Manual load/unload with an Ultima 150/DT-100 welding system and PLC for control of the sequencing. Wire feeder and AVC (arc voltage control), small longitudinal welding fixture for seam welding, numerous copper chill clamps and fixtures, 3 jaw chucks, 5C collets, collet stops and other work holding tooling. Two stereo microscopes and one digital microscope with photo capability. Plasma powder feeder and powder feed torches.